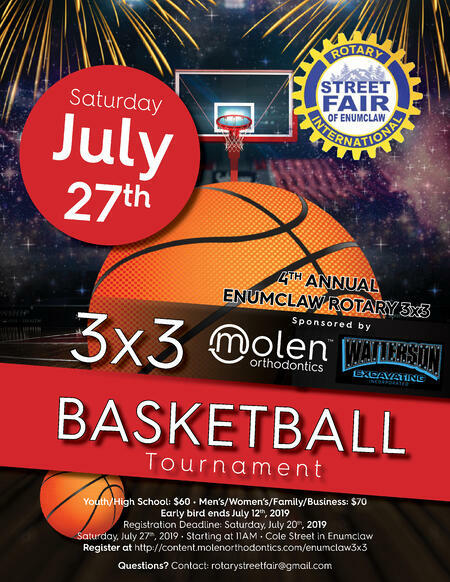 Enumclaw Rotary's 4th Annual 3x3 basketball tournament for all ages! Come join us on Saturday, July 27th, 2019 at 11AM on Main Street in Enumclaw. Enumclaw Rotary's 4th Annual 3x3 basketball tournament for all ages! Friday, July 20th or until divisions are full. No refunds unless divisions are cancelled. Print and fill out registration form and drop off with payment at the Enumclaw Rotary. You can download the registration form by clicking below. Pay with cash: Must drop off payment to The Enumclaw Rotary. Pay with check: Make checks payable to the Enumclaw Rotary Foundation. Please drop off payment and registration at The Enumclaw Rotary - 718 Griffin Ave #9 Enumclaw, WA 98022 or email registration to rotarystreetfair@gmail.com. Waiver: PLEASE READ AND INITIAL, ENTRY FEE IS NON-REFUNDABLE. DUE TO INSURANCE REQUIREMENTS, INCOMPLETE OR PARTIALLY FILLED OUT FORMS WILL NOT BE ACCEPTED. I accept responsibility for the accuracy of the information provided. In consideration of acceptance of my entry (l), legally bound for myself and anyone entitled to act on my behalf (spouse, dependents, guardians) do hereby release and discharge the Enumclaw Street Fair, agents, contractors, volunteers, including the following: BuDu Racing, Enumclaw Chapter of Rotary International, City of Enumclaw, any and all sponsors and/or contributors associated with the Enumclaw Street Fair and the Enumclaw Street Fair 3 on 3 from any and all liability (now and in the future) arising from illness, damages, death or any acts of God that I might suffer as a result from my participation in the Enumclaw 3 on 3. I further grant permission to the Enumclaw Street Fair to use my photograph, motion picture or recording for any legal purpose they deem. If participant is under the age of 18, I certify by my signature that the child has permission to participate, is in good physical condition, and officials may provide any/all medical treatment in the event of injury or illness.